This is a course but humorous print of Baron Hompesch, a Swiss nobleman and officer in the British army, lifting the dress of William Garrow in order to deliver a thrashing, in response to his being examined harshly in a trial in which he was a witness. 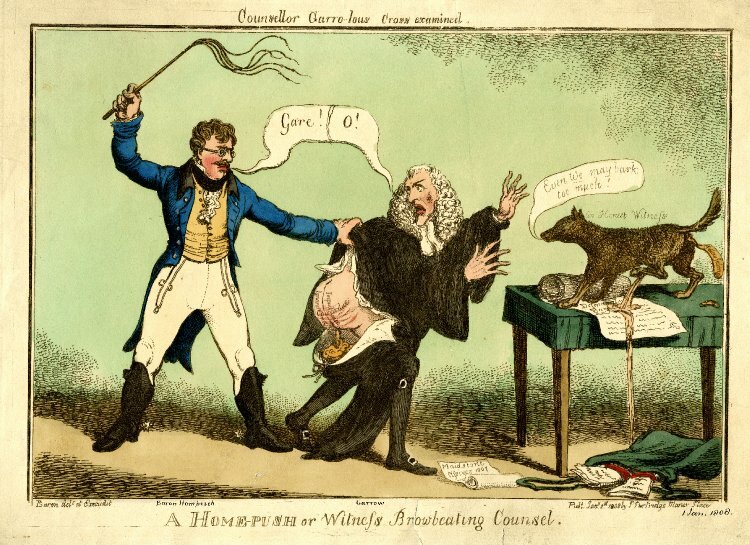 The Baron is shouting “Gare!” and his victim, Garrow, is exclaiming “O!” This is illustrative of an often quoted trial in which a farmer Sherwood is being tried for a violation of the game laws – trespassing on Hompesch’s land to hunt game. Garrow produced the farmer’s dog as a key witness – and an “honest witness” to discredit the Baron’s testimony. The Baron became so enraged that he challenged Garrow to a duel – which Garrow declined. In turn, the Baron wrote a letter to the Prince Regent declaring that Garrow was unfit to be received in the company of gentlemen. The trial is fun to read and includes an exchange in which the Baron acknowledges that he and farmer Sherwood used to get together for friendly games of sixpenny whilst at the Baron’s home until farmer Sherwood’s wife showed up and boxed her husband’s ears and made him come home. The Baron then sent farmer Sherwood some wine to refresh his spirits and an ornamental horsewhip to use on his wife. Here again, the whole story has yet to be fully recovered from the dusty records of the early 1800s. We understand that Garrow, as he threatened in the trial, did take the Baron to court and convicted him of having written an obscene and indecent libel on Mr and Mrs Sherwood. We are hoping that someone will search the records and recover and share that additional trial record – it should contain some rather colourful exchanges between the Baron and Garrow. I did not see any mention of the 1789: The Old Bailey Advocate bringing off a thief. Next PostNext NEW Series of “Garrow’s Law” about to be aired!